Here’s my problem with Fashion Week: You see all these gorgeous clothes, hairstyles, and makeup looks, but then you’re supposed to wait six months before you actually wear them. Where’s the fun in that? I get that I can’t just swipe the clothes off the runway immediately (well, at least not without facing some criminal charges), but I can’t think of one good reason not to try spring 2012’s beauty trends right away — especially when they’re as cute as the ones I found backstage at Mercedes Benz New York Fashion Week. 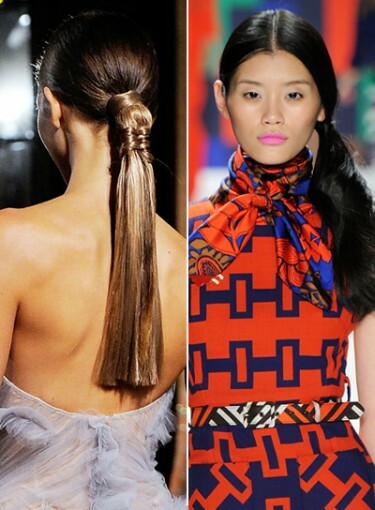 Click here to see the best fashion week hairstyles and makeup. Ready for a sneak peak at the trends? Well, the big things at Fashion Week for spring 2012 were wet hair (ew) and dewy skin (yay). But there were also a ton of creative styles I’ve literally never seen before, but now can’t get out of my head. Stuff like a geometric bun that’ll wow your friends and a totally new lip shade that’s flattering on everyone. Are you starting to get why I couldn’t possibly wait six months to try these? So, are you with me? Want to ignore the “rules,” be ahead of the game, and try a few spring trends this fall? If so, then keep reading to see my picks for the must-try hair and makeup looks from Fashion Week. And if you’re really stuck on being “in season,” you can check out this fall trends guide instead. I won’t judge. Well, maybe just a little.